Hi! My 101 Things that Mothers with Eczema Child do Differently cartoons are coming to an end, and I thought running a Pinterest contest with US$25 MONEY (from my paypal) would be a neat way to thank you for the support and have some fun! 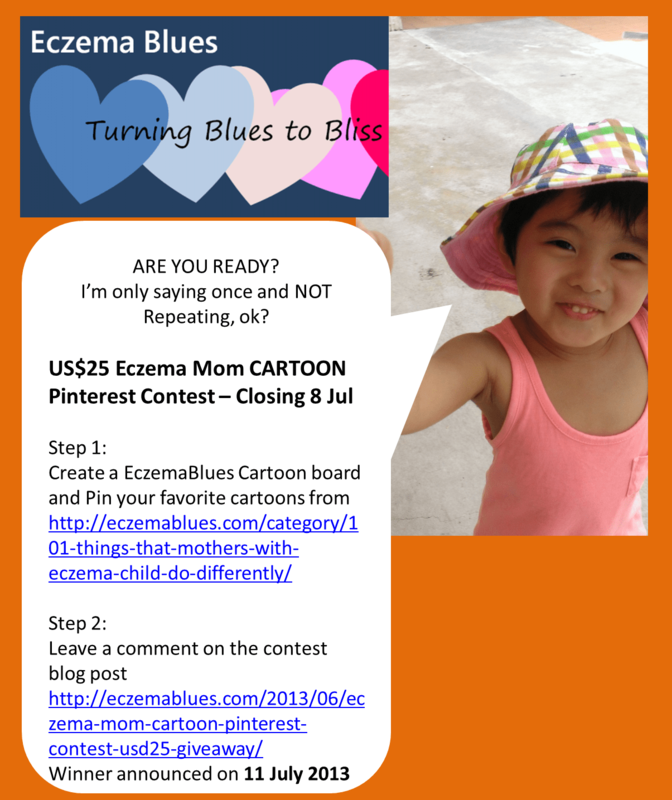 Step 1: Create a board named “EczemaBlues Cartoon” and pin your favorite cartoons from the 101 cartoons, full link here: http://eczemablues.com/category/101-things-that-mothers-with-eczema-child-do-differently/ If you find other cartoons outside of my blog, feel free to pin too! Oh, also, dads can take part too, anyone (with or without eczema) can. Step 2: Leave a comment in this post with a link to your EczemaBlues Cartoon board (be sure to enter your email address so that I can contact you to redeem the prize) If you can’t manage to get the comment through (it’ll be moderated, so check back within a day), tweet me (@marciemom) to let me know. The contest ends on 8 July (whichever time zone you’re in), judging will start from 9 July and the winner be announced in this blog on 11 July. The winner will get USD25, direct transfer from my paypal to yours! If for whatever reason the paypal transfer couldn’t get through, I’d use the US$25 to purchase something you want (including delivery charge) from a site that accepts paypal. Something for Everyone: If you’ve taken part in this contest and like to have an electronic version of my A to Z Animals are not Scratching! book (selling at US$1.99), please leave a comment asking for the ebook in this post (with your email filled in) so that I can send it to you. Make my day – while you’re on this site, do subscribe to my email list and newsletter (at top right side banner). I’m not making this part of the contest, cos I know parents are busy, but if you can find the energy to submit your email, I’d be very happy! 5. I’m (of course) assuming that you know how to pin. Pin from my website, and NOT save the cartoon to your computer then load it back to pinterest. Thanks Connie! Checking out your Pinterest board! 🙂 Have a good day! I love your site Mei. I’ve been reading it since my baby Michael Max was first diagnosed at 6 weeks. He is now 18 months. Your cartoons helped my husband and I relieve some stress and we cannot thank you enough! When we most felt alone in our battle to help our baby find relief, your cartoons brought a smile (much needed one) to our faces. Thank you, thank you, thank you! Thanks Ana! Following your board and thanks for taking the time to go into Pinterest despite it not being your main social media platforms! Thanks Tasha! and thanks for introducing me some fun cartoons via your board too! Great idea, Mei! 🙂 I’m not really entering since I don’t have an Eczema sufferer close to me, but I’ll show my support by adding your cartoons anyway. Thanks Poochie, very blessed to have your support! Thanks Marissa! Have hopped over to your board and loves fab, even more is it has helped your family w some laughter! Thanks Selena! The pins show up a while, got to reload your board page then it will appear (after you’ve got the box that says successfully pinned). Is this what you’re referring to?